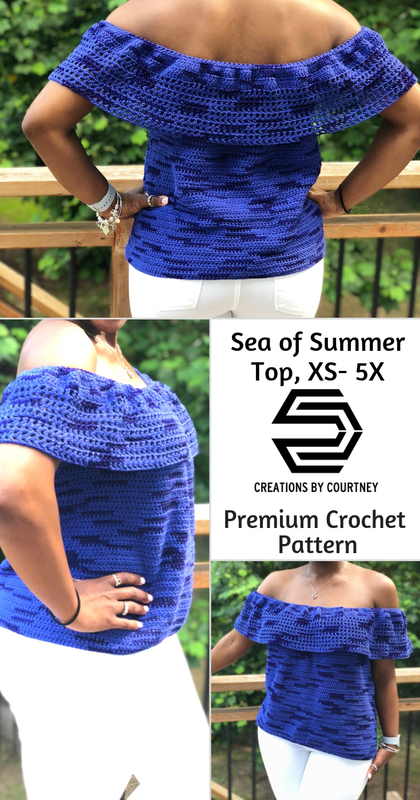 The Sea of Summer Top was inspired by the returning trend of off-the-shoulder tops. There are so many different styles of off-the-shoulder tops and dresses with flower, lace and more. Some have sleeves, and others have ruffles upon ruffles. 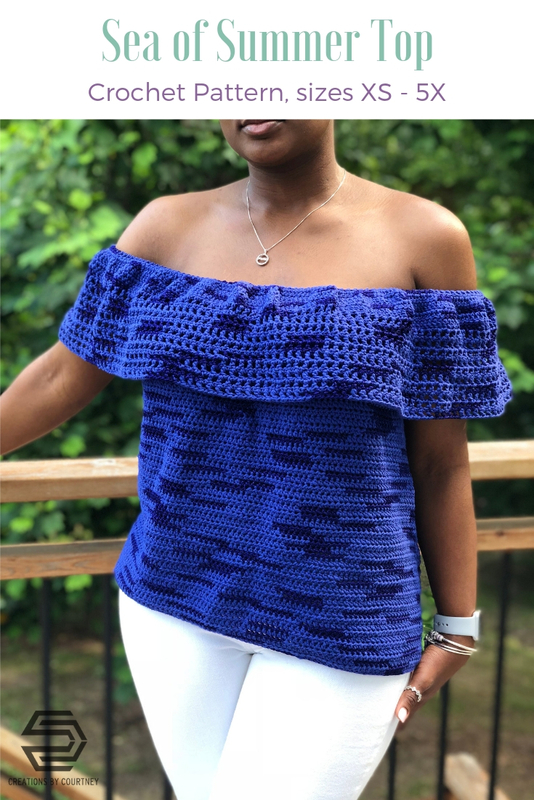 I wanted to make a simple, stylish look that allows the color and yarn to take center, whether you wear it to a spring picnic or dinner with friends on a restaurant patio. 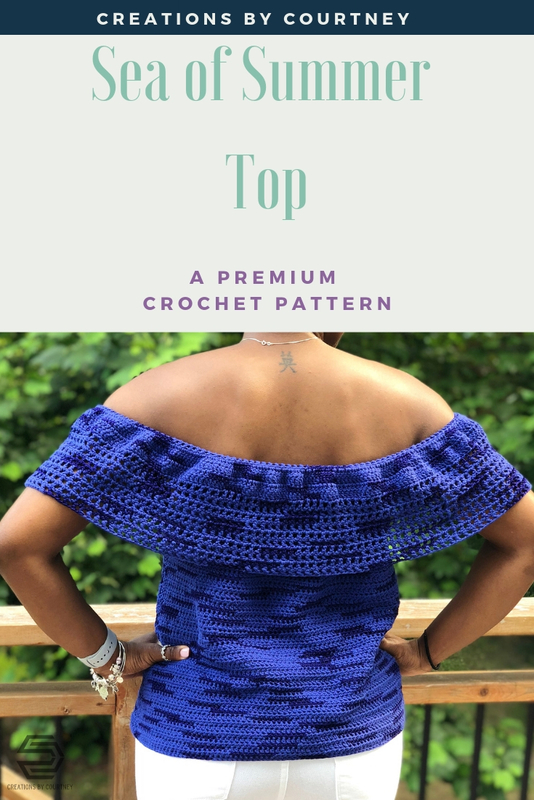 This will be one of your favorite tops to make in every color for all occasions, and relatively quick to make for a wearable item. It’s designed to be relaxed through the body and hips with very only a few decreases. It’s a forgiving shape to compliment the smallest frame through 5X! I have included the measurements for sizes XS through 5X so if want a looser or tighter fit, pick a different size. But be sure to have enough yarn in one color or more. Directions are for size X-Small, Small, Medium, Large, X-Large, 2X-Large, 3X-Large, 4X-Large and 5X-Large. Garment is made with 4” of positive ease. Each size is written separately for ease of following the pattern. The pattern is made in four parts: the body, the front, the back and then the ruffle. First-hdc can be replaced with ch 2, either method counts as hdc throughout pattern, unless otherwise noted. The first-hdc is recommended to make the seam less noticeable. 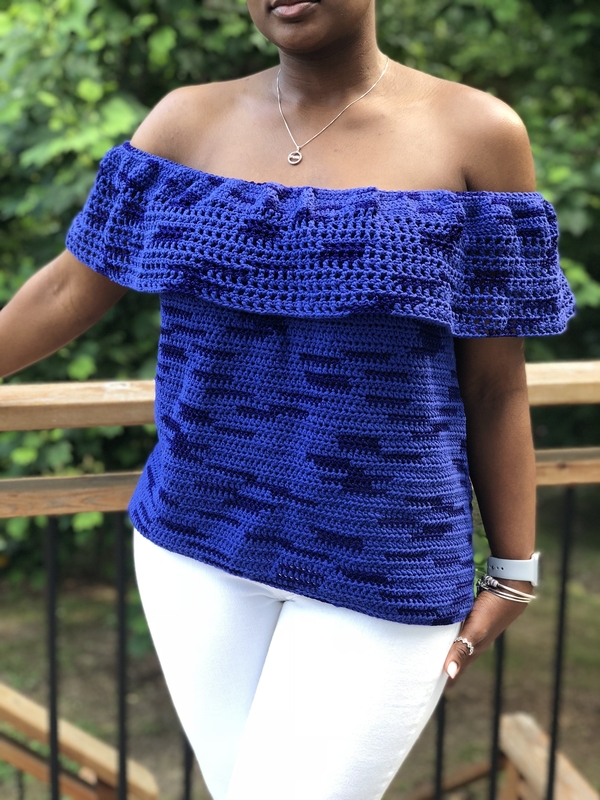 The foundation half double crochet can be substituted by chaining the same number, slip stitching to create a ring, and then making the same number of half double crochet. 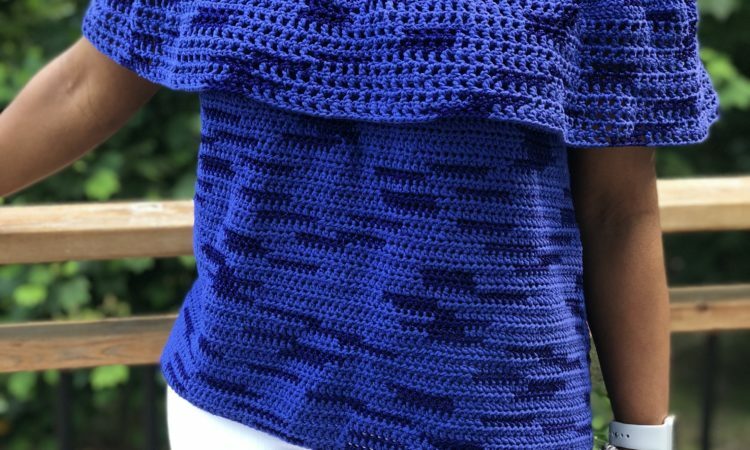 The Ruffle measurements provided are recommendations, but can be adjusted by taking a string or piece of different yarn to wrap around your shoulders to get the best measurement and fit. First-dc is recommended to minimize seam on the ruffle. Two options for the ruffle are provided for Sizes X-Small through Large, and one option is offered for Sizes X-Large through 5X-Large. Either option can be used for any size, but the ruffle can become heavy for the largest sizes. Each size is written separately, and the ruffle is written for all sizes at bottom of pattern.